With family and close friends around, Priyanka and Nick had their traditional engagement ceremony (Roka) in Mumbai today. The bride-to-be wore an Abu Jani Sandeep Khosla chikankari suit with jewellery from Mahesh Notandass and Needledust jootis. The groom-to-be kept it simple in a white kurta pyjama. Our congratulations to the couple! Wearing Three Graces, Priyanka attended Manish’s party at his home. Dark lip color, gold-toned jewelry, a Chanel bag and pair of matching sandals rounded out the actor’s look well. She worked them separates! Love the color on her; Priyanka looked good. Wearing a bell-sleeved bodysuit and sheer smock waist pants, both from Caroline Constas, Priyanka attended a women’s event in Delhi on Tuesday. Not that I was a fan of those sheer smock waist pants, but if this were a beach-side event, I’d probably still be like, it works, it’s just not my taste. But, given the event, am I the only one going, the outfit was totally out of place? For a spot of travel, Priyanka teamed her slouchy denims with a white crop-top and cardigan. Sunglasses, white shoes and a pop of lip color rounded out the actor’s look rather well. She worked her off-duty look! 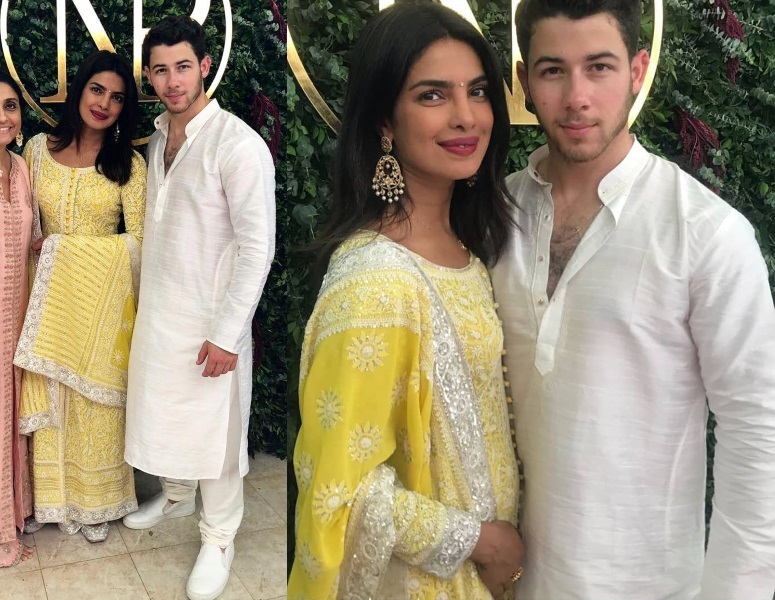 While out and about with Nick this week, Priyanka was seen in three different looks, a L’Academie dress, a black top and polka dot Nanushka pants and finally in a white top and a Balmain skirt. I hate to say this, but I do wish Priyanka would switch back to her previous stylist (Cristina Ehrlich). She looks too much like the Hadids and one doesn’t really see her individual style anymore. Just me feeling that way?